Like many people, attorney Mike Flaherty (Paul Giamatti) is struggling to make ends meet. 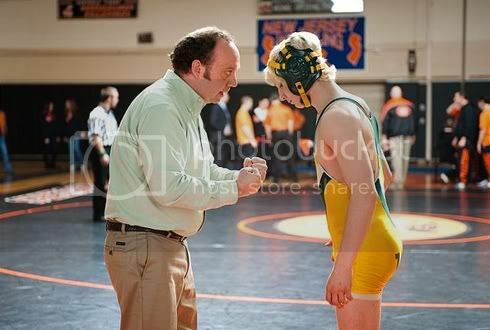 Between clients, he juggles duties as a family man while moonlighting as a high school wrestling coach. And his team is terrible. When Leo Poplar (Burt Young), a man in the early stages of dementia, is on the verge of becoming a ward of the state, Mike sees an opportunity to supplement his income by taking over guardianship. The plan seems fool-proof as Leo is placed in a nursing home while Mike collects the $1500-a-month stipend, but a potential kink arrives in the form of Leo’s never-seen-before grandson, 16 year-old Kyle (Alex Shaffer). After much contemplation, Mike and wife, Jackie, (Amy Ryan) reluctantly take in the troubled, but polite, teen while trying to locate the boy’s mother back in Ohio. Kyle takes the opportunity to connect with the grandfather he never knew, but also solves Mike’s other problem by proving to be an explosive and talented wrestler. With the team winning and the extra income easing his financial burdens, Mike has no guilt about his win-win situation, until Leo’s derelict daughter Cindy (Melanie Lynskey) shows up, fresh out of rehab, to reclaim not only her son, but the monthly $1500 she believes she’s entitled from the father she hasn’t seen in twenty years. Cindy’s arrival throws Kyle into turmoil right before he’s to wrestle in the biggest match of his young life. Without much effort, Mike exposes the young mother’s motives, but Cindy’s acquisition of a court document threatens to reveal the attorney’s questionable business decision. Mike is then stuck between doing what’s right for Kyle and Leo and exposing himself as an unethical opportunist and causing harm to his own family. My impression of the film is a stellar, if not underrated, cast delivering understated performances of humor and emotion. Giamatti and Ryan have great chemistry as husband and wife, while newcomer Shaffer holds his own amongst season professionals. The biggest surprise is the laughs provided by secondary characters, like Stephen and Terry, played by Jeffery Tambor and Bobby Cannavale, respectively. The humor is subtle and smart and is tempered by tender, heart-warming moments. Writer/director Tom McCarthy (THE STATION AGENT, THE VISITOR) has managed to create a moving portrait of simple people leading complex lives, showing sometimes good people make poor choices with the best of intentions, but in the end, true character will always be a win-win. Good review. 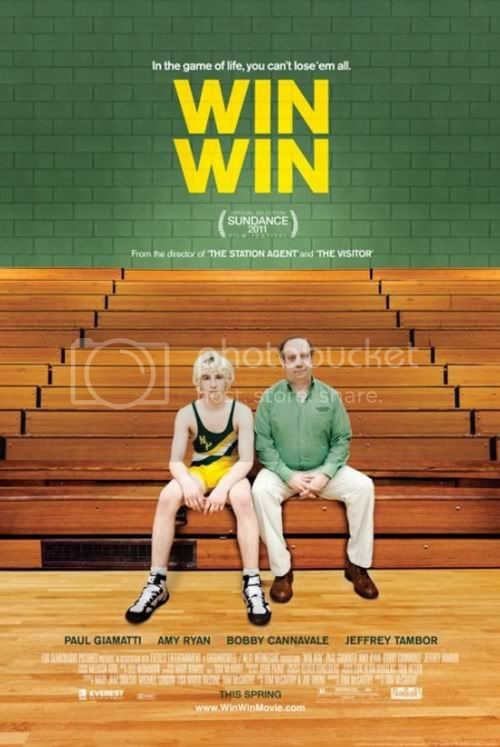 I generally agree that "Win Win" was a good movie with an underrated cast. It seems almost any movie becomes entertaining once it casts Paul Giamatti. And I was pleasantly surprised by Amy Ryan. Even though she is good in "The Office," I was worried that I could not accept her outside that familiar role, but she was very good.